We've all been in traffic somewhere when a police car goes speeding by with lights flashing and sirens blaring. If you're like most of us, you've probably wondered where they were going. But have you ever wondered who sent them zipping down that highway in the first place? How did they know they were needed? A police dispatcher directed them. The job of a police dispatcher is an often overlooked but no less important role within the field of law enforcement. Make no mistake, working as a dispatcher can be incredibly stressful. Dispatchers are often responsible for doing double duty as 911 operators. They take calls for service then send law enforcement to the scene. Dispatchers are often the first point of contact for people in desperate need of help, people who may not even be coherent when they make the call. But dispatchers have to remain calm and keep their wits about them no matter how bad the situation sounds. They have to make sense of what the caller is dealing with so they can make sure people get the exact emergency services they need. Police dispatchers must be able to multitask and deal effectively with different personality types. They must remain in control of their own emotions so they can help victims remain calm. You've probably heard stories of dispatchers walking people through CPR over the phone, talking calmly to those who have reported gruesome tragedies, and even talking people out of committing suicide. In these and many other circumstances, dispatchers may find themselves as long-distance lifesavers. What Education or Skills Do You Need to Be a Police Dispatcher? A high school diploma is typically the only formal education required to become a dispatcher. Experience working with other people, especially in customer service-related industries, is very helpful. Strong communications skills are a must, as well as the ability to speak clearly and coherently. 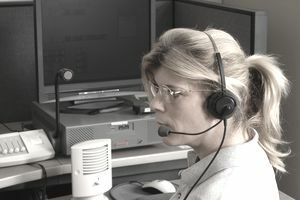 As technology is used more and more in law enforcement, dispatchers must be proficient on a computer and must learn some complicated programs. Police dispatchers and 911 operators use computer-aided dispatch programs to help keep track of calls and assign case numbers. The Bureau of Labor Statistics indicates that jobs for police, fire and ambulance dispatchers will decline by about 3 percent by 2024. Advances in emergency technology are slowly taking over some of a dispatcher's job duties, but turnover is always an issue in such a stressful position so job openings do become available. There were 102,000 dispatcher positions available in the U.S. in 2014 and this is expected to decline by about 3,000 jobs by 2024. The median salary for dispatchers was $38,010 in 2015, a little over $18 an hour. Is a Career as a Police Dispatcher Right for You? Anyone looking to become a dispatcher should have a strong desire to help others, a strong ability to multitask, and a thick skin to be able to remain calm and deal with people who are in their greatest moments of need and distress. Landing a job as a police dispatcher can be a great entry point for other work in criminology, or you can spend a full career in dispatch. In either case, working as a dispatcher is a great way to serve your community and help other people.